A Representative and a Senator from Maine; born in Bangor, Penobscot County, Maine, August 28, 1940; attended the public schools; graduated, Bowdoin College, Brunswick, Maine, 1962; graduated, Boston University Law School 1965; admitted to the Maine bar in 1965 and commenced practice in Bangor; instructor, University of Maine 1968-1972; assistant county attorney, Penobscot County 1968-1970; member, Bangor City Council 1969-1972; member, Bangor School Board 1970-1971; mayor, city of Bangor 1971-1972; author; elected as a Republican to the Ninety-third Congress in 1972; reelected to the Ninety-fourth and Ninety-fifth Congresses (January 3, 1973-January 3, 1979); was not a candidate for reelection to the House of Representatives, but was elected in 1978 to the United States Senate; reelected in 1984 and again in 1990 and served from January 3, 1979, to January 3, 1997; not a candidate for reelection in 1996; chairman, Select Committee on Indian Affairs (Ninety-seventh Congress); Special Committee on Aging (One Hundred Fourth Congress); Secretary of Defense in the Cabinet of President William Jefferson Clinton, 1997-2001; Chairman and CEO, The Cohen Group 2001-. Mr. Cohen has been Chairman and Chief Executive Officer of The Cohen Group, a business consulting firm, since January 2001. Prior to founding The Cohen Group, Mr. Cohen served as the United States Secretary of Defense from January 1997 to 2001. 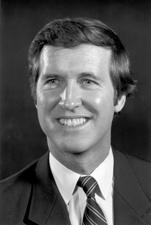 He also served as a United States Senator from 1979 to 1997, and as a member of the United States House of Representatives from 1973 to 1979. James Ortenzio Republican power broker; J.A.O. Holding Co., Inc.
Max M Fisher Businessman, Jewish community leader.